From the book: "How to Cure Almost Any Cancer at Home for $5.15 a Day"
This formula is ideal to take also as a preventive every morning as breakfast and you will notice a dramatic improvement in your health. "The Budwig formula is so simple and easy to make it seems ridiculous. You simply combine two-thirds of a cup of cottage cheese (ideally low-fat, organic) with one-third of a cup of fresh, refrigerated flax oil and mix it in a blender. Or you can mix it with a hand-blender (also called an “immersion blender”). Stirring isn’t good enough. To mix it properly, you have to blend it. Once you’ve mixed it, you can add —if you wish —whatever kind of fruit you want: strawberries, blueberries, or whatever is your favorite. You can also add something like almonds or walnuts." I don’t recommend peanuts because peanuts are often heavily laden with pesticides or fungus. Adding fruit should make the Budwig mixture sweet enough. But if you want more sweetener, just add stevia — a natural sweetener that doesn’t feed cancer cells. Enjoy this great formula for a healthy you. ​God Bless and be Spiritual, Happy & Healthy. Coming soon will be several product recommendations I will suggests to use in the recovery of you immune system who will fight till gone any chronic disease you may be fighting. The immune system is the one that will free you from the condition without covering the symptom as conventional medications do. Become a weekly reader and I will share several informative pages on the subject. I am pleased to be able to share with all who care about health threw nutrition that it is all posible if we really desire a healthy life including recovery of mostly any desease, I will be talking about interesting ways to achieve this. The ideal health status is not only achieved threw what we eat it also includes a spiritual and life style input. We need to also exercise our body mind and soul. I will be writing of all I have discovered on my journey at IIN and recommending important books and publications available to broaden our knowledge of the topic. 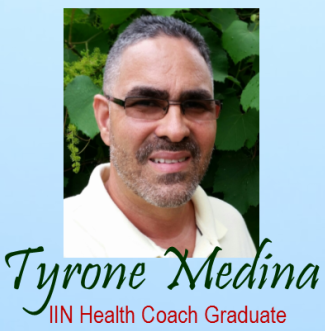 My name Tyrone Medina a proud IIN Graduate.